Upon arriving in Roswell, New Mexico, we made a beeline for the International UFO Museum to investigate the infamous “Roswell Incident” for ourselves. After outgrowing two previous locations since its inception in 1991, the museum is currently in the former Plains Theater in downtown Roswell. Entering the parking lot, you’re greeted by what we imagined was a life-sized UFO protruding from the side of the building, as well as surrounding murals that set the mood for our visit. We walked past the gift shop to the main entrance, paid the $5 admission, and slipped on our reading glasses. While we’re used to a lot of reading in museums, this one requires some serious time and patience to absorb the enormous amounts of information offered. Especially since every document is printed in the tiniest font they could seem to find. The museum begins with the Flying Saucer mania of the 1940s expressing the world’s addiction and fascination with tiny beings from other planets. Then you get into the meat of the Roswell incident. In 1947, rancher “Mack” Brazel, while checking on the horses after a thunderstorm, discovered what he believed was a flying saucer downed in the field. He recovered many pieces including the ship itself which he stored in his barn. Quickly, military investigators under the direction of Major Jesse Marcel confiscated the “evidence” and issued a press release. The press release basically said “we have in our possession a flying saucer,” and hundreds of papers across the nation ran the story as a headline. Within 36 hours, the military reissued a press release stating that the recovered material was from an experimental weather balloon. End of story right? For thirty years it was. But, in 1978, Jesse Marcel expressed to UFOlogist Stanton Friedman that he believed there was, in fact, an alien spacecraft recovered in the field that day and that the military covered up that discovery. By 1989, when mortician Glenn Dennis provided a detailed personal account intimating that alien autopsies were carried out at the Roswell base, Roswell became the center of the UFO universe. Of course evidence indicates that the timelines described by Dennis, Marcel and many other “eye witnesses” don’t match effectively with the details of the moment, but, the town, over 200 miles from any major city, relies on tourists to keep the many alien focused gift shops and restaurants afloat, and the UFO Museum is a key draw – so, I think it’s best if we keep on believing! For more about the UFO Museum, click here. Also, we thought we should share some mysterious video of something we saw as well – so click here for that! 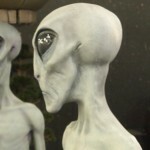 great pics on this, so is the alien real? No… just a bad reproduction of a supposed autopsy!